Ни сло́ва не говоря, Тиму́р кивну́л голово́й. Not saying a word, Timour nodded his head. Он повтори́л мой вопро́с сло́во в сло́во. He repeated my question word for word. Я попыта́юсь объясни́ть в не́скольких слова́х. I will try to explain in a few words. Я не верю вашим словам. I don't believe what you say. literal I don't believe your words/promises. It is impossible to put into words. Эти слова́ прозвуча́ли ка́к-то стра́нно. These words sounded in a strange manner. Она́ говори́ла ме́дленно, подбира́я слова́. She was talking slowly, selecting the [right] words. Вы сде́лали оши́бку в э́том сло́ве. You made a mistake in this word. По́сле выступле́ния дека́н дал сло́во студента́м. After the speech, the dean gave the floor to students. Честное слово! = Honestly! ; I'm not kidding! по словам кого-либо. = according to smb. 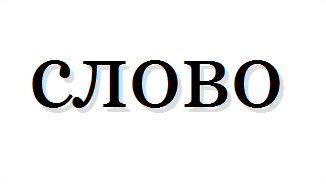 печатное слово = printed word; publications, books, etc. Слово не обух -- в лоб не бьёт. literal Where there are many words, there are few deeds. Не давши слова -- крепись, а давши -- держись. Don't make a promise you can't keep. literal Not having given a word try to prevent to promise, but having had given a word be strong. Слову верь, а дело проверь. Words are the wise man's counters and the fool's money. literal Believe to a word, but verify the deed. Less gab and more action. literal Less words, more deeds. Слово не воробей, вылетит -- не поймаешь. A word is not a sparrow, once it flies out, you won't catch it. Слово -- серебро, молчание -- золото. Word is silver, silence is gold. Красивыми словами сыт не будешь.